Yokogawa Electric Corporation enhanced its FieldMate® device management software and launched the new version FieldMate R3.02. This latest version of FieldMate includes new functions that reduce maintenance workload by simplifying a number of field maintenance tasks. Digital communications standards are playing an increasingly important role in communications between plant central control systems and field devices. With a number of digital communication standards in use today, plants often have devices from multiple vendors that use different standards. Software tools are thus required that have the versatility to configure, adjust, and manage these devices. With this latest update, FieldMate has become even easier to use and improves the efficiency of field maintenance operations. Previous FieldMate versions could run on Windows® 7 PCs and tablets. With release 3.02, 2 FieldMate can now be used on PCs and tablets that run Microsoft’s latest operating system, Windows 10. This is particularly significant because Windows 7 and 10 tablets are increasingly being used in the field by maintenance personnel. 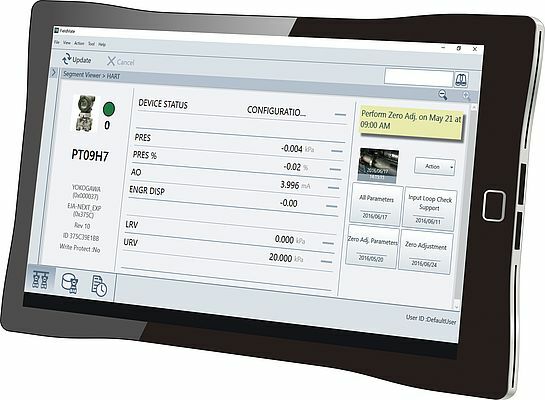 Zero point adjustment: Zero point adjustment can be performed for a Yokogawa differential pressure/pressure transmitter by simply connecting the FieldMate R3.02 PC or tablet to the target device and clicking (touching) the Zero Point Adjustment button. Input loop check: Regardless of device model or make, all it takes with FieldMate R3.02 is to click (touch) the Input Loop Check Support button to output a loop check signal from a device. With FieldMate R3.02, the output signal can also be easily set to the desired level to create a test pattern, which can be saved and retrieved. Compared to a conventional handheld terminal, this function reduces work time by one third. With FieldMate R3.02, it is possible to compare current values and previous settings for a parameter by just pressing the All Parameters button on the home screen. This function is useful for verifying changes made by field 3 maintenance personnel and for troubleshooting problems. FieldMate Validator is an optional software tool that is used to verify the connections between newly installed field instruments and control system I/O devices. With this latest release, FieldMate Validator now supports the I/O devices that were developed to facilitate quick upgrades to CENTUM VP R6.03.